Almost perfect, almost serene, almost discreet and indiscreet, almost happy. The sensitivity of a circular and irregular line that defines the shape of each design, defining a center and perimeter that are none accurate or symmetrical. The shapes and sizes allow different combinations in various environments. Spots of true inspiration and talent! 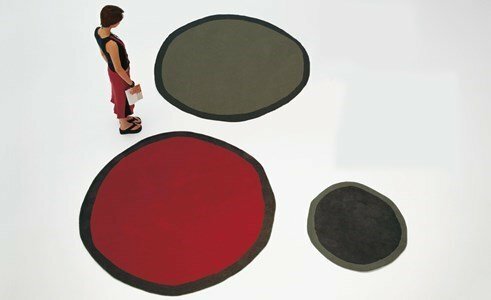 Handmade, using the system "HandTufted", 100% wool of New Zealand and Bikaneri. Has density of 53.500 knots/m2. The height of the pile is 114mm and the total height of the rug is 20mm, weights 4,5kg/m2.